Ethiopian Cabinet reshuffling by new Premier Abiy- Readjustment or a change in continuity? 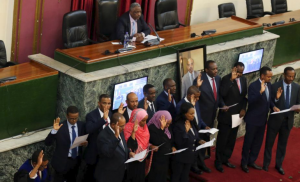 Ethiopian Cabinet reshuffling by new Premier Abiy- Readjustment or a change in continuity? Premier Abiy, named 16 ministers, 10 new but retained the finance and foreign ministers from the cabinet of his predecessor Hailemariam Desalegn. Abiy also named new industry, energy, trade, mining, health, and revenue ministers, as well as an attorney general. Negeri Lencho, was appointed by Hailemariam during a previous state of emergency in November 2016 as part of an earlier effort to increase Oromo representation in the top government posts.He is replaced by the former transport minister Ahmed Shide, the highest-ranking ethnic Somali in government. This internal Readjustment the ruling TPLF could not help to implement reforms demanded by the public during unrest in which hundreds were killed by security forces. 5. Cabinet internal reshuffling rather than reforming by engaging the oppositions from home and diaspora. Sheferaw Shegute Wolasa, Minister of Agriculture and Animal Resources. Born in Haroressa of Arsi Zone. Served in various government institutions at various levels for 27 years, as Deputy Chief Administrator of SNNPR and later Chief Administrator of the regional state, Minister of Education, Executive Committee member of EPRDF, Head of the Center for the Building of Democratic System at the Office of Prime Minister with the rank of Minister and now. Siraj Fagessa Sherefa, Minister of Transport. Born in Silte Zone. He also served as Minister of Pastoral Affairs, EPRDF Executive Committee member, Deputy Chairman of SPDM and later on Minister of Defense. Dr. Hirut Woldemariam, Minister of Labor and Social Affairs. Born in Gojam.She served as a lecturer at Addis Ababa University for many years and also worked as a researcher in the Ethiopian Languages Academy. Ambassador Teshome Toga, Minister of Government Development Enterprises. Born in Wolayita Sodo. He served as Ambassador of Ethiopia to Ghana, Egypt, Kenya, France, Belgium and EU; and also as Minister of Culture, Youth and Sports. Omer Hussien Ouba, Customs and Revenue Authority Director-General with rank of Minister. Born in Arsi. He served as head of Arsi Zone Finance and Revenues Bureau, Head of Oromia Finance and Economic Development Bureau, Head of Oromia Urban Development Bureau. EPRDF Executive Committee member, and later on Deputy Chief Administrator of Oromia Regional State. Ouba Mohammed Hussien, Minister of Communications and Information Technology. Born in Addis Ababa. Served as the member of Somali Regional Council, Head of Justice and Investment bureaus in the region. She also served as Women and Children Affairs State Minister and Commissioner for Women and Children’s Affair in the Office of Human Rights Commission. Dr. Ambachew Mekonnen, Minister of Industry. Born in South Gondar. He served as Director of Amhara Public Service Institute, Director of Amhara Rehabilitation and Development, Commerce and Industry Bureau Head with the rank Deputy Regional Administrator, Head of Industry and Urban Development Regional Bureau, and finally Minister of Construction. He is member of EPRDF Executive Commitee. Motuma Mekassa, Minister of Defense. Born in Gendeberet. Married. Education: BSc and MSc in Statistics. Served as bureaus head in Oromia Regional State, Minister of Water, Irrigation and Electricity, Head of Oromia Water, Mines and Energy Bureau. He is EPRDF Council member and member of OPDO Central Committee. Minister of Mines, Energy and Natural Resources. 9. Fozia Amin Aliye, Minister of Culture and Tourisim.. Worked as Oromia Anti-corruption Commissioner. Head of Women’s Affairs Bureau of Western Harerge, and Secretary-General of Office of the Ombudsman. OPDO Central Committee member. Ahmed Shede. Government Communications Affairs Office Head with the rank of Minister. Born in Negelle Borena. Served as Agriculture and Rural Development Bureau Head of Somali Regional State, Civil Service Reform Bureau Head, Somali Region Investment Bureau Head, and later State Minister of Finance and Economic Cooperation. He is Central Committee Member of Somali People’s Democratic Party. He was Minister of Transport to date. Jantirar Yigzaw Abay, Minister of Urban Development and Housing. Born in Wollo. He served as North Wollo Zone Deputy Administrator, Head of Urban Works and Development and Deputy Head of Amhara Bureau of Industry and Urban Development, Head of Amhara Road Transport. Head of Amhara Road and Transport Bureau to date. Melese Alemu Erboro, Minister of Mines, Petroleum and Natural Gas . Born in Hadiya. Served as Administrator of Hadiya Zone. SNNPRS Anti-corruption Commissioner. Deputy Chief Administrator of SNNPR. EPRDF Executive Committee member. Brehanu Tsegay Abera, Attorney General. Born in Becho. . Served as Head of Oromia Justice Bureau, Deputy Head of Oromia Justice Bureau, Head of Oromia Construction Bureau, State Minister of Justice. He is OPDO Executive Committee member. Yalem Tsegay Asfaw, Minister of Women and Children’s Affairs. Born in Dogea Tembien Agere Selam. Served as Deputy Head of Tigray Health Bureau, Tigray BoLSA Head, and Chief Administrator of Eastern Zone of Tigray. Melaku Alebel Addis, Minister of Trade. Born in Amhara Gondar. Married. Served as Deputy Head of Amhara Region Industry and Urban Development Bureau, Deputy Head of Trade and Transport Bureau, Amhara Investment Commissioner. Dr. Amir Aman, Minister of Health. Born in Bahir Dar. Served as Planning, Policy and Finance Head at the Ministry of Health, Medical Director at Limu Genet Hospital in Oromia. State Minister of Health to date.